I'm ashamed to say that, until this year, I'd yet to find a really delicious way to cook garlic scapes. As a result, I plucked the scapes out of our hardneck garlic last year...and let them compost in the garden. I'll never do that again now that I've tasted roasted garlic scapes! 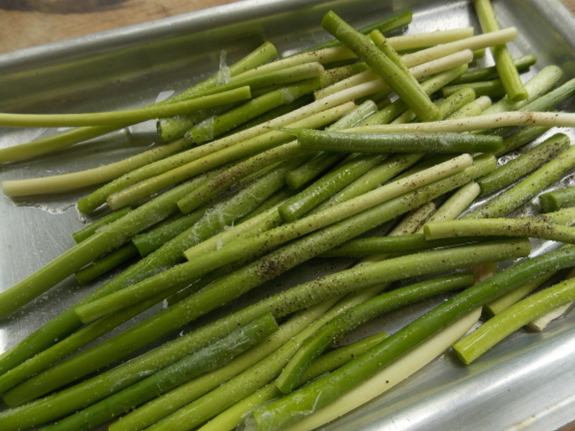 I roast scapes the exact same way I roast asparagus. After pulling the scapes out of the garlic plants, I break off the tops (which are tougher and less tasty), then pile the sweet bottom portions onto my toaster-oven tray. A drizzle of oil and a sprinkle of salt and pepper season the scapes, then I turn the toast oven on high and cook for about thirty minutes, stopping a couple of times in the middle to shake the pan and turn the scapes around so they all get coated in oil and equally browned. The finished product (not pictured) is somewhat shriveled, with every scape at least lightly browned. The taste is like roast garlic, but sweet and mild enough to be eaten as a side. Delicious! I always just use mine like I would garlic, but twice as much. It looks really nice in tomato dishes, potatoes, even beans. Next year we are going to try pickling them (like you would beans) as we love pickled garlic. I hadn't even considered roasting them as a side dish... Sounds delicious! Since you mention this... I'm now a bit confused about my garlic. You see, we have an amazing amount of wild garlic down a nearby dirt road. Back in spring 2012, I harvested some of the "bulbils" from the umbels. The bulbils are each about the size of a popcorn kernel. I planted these in my garden. Spring 2013, they formed just leaves and looked more like chives. This year, they are very large and forming scapes. I pulled back the bedding a bit, and the bulbs in the ground are quite large. Larger than I would expect from a true wild variety. I do live around a lot of old farms, some of the old barns and farmhouses being over 100 years old. Do you think this is a domesticated cultivar that escaped years ago? Or does wild garlic really become this large when babied in a raised bed? Roberta --- That's definitely a cultivated, hard-neck garlic. What I call wild garlic is Allium vineale, which looks very different and is a common weed in unkempt lawns. 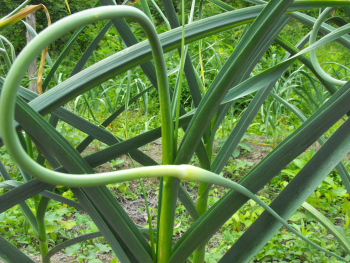 On the other hand, run-down cultivated garlic patches like yours are often found around old farms. If you treat them like cultivated garlic in the garden, they should work well for you! Wow! I'm very happily surprised by this! Thank you for your help. Looking around on the internet was just confusing me because there are so many types of garlic and chives. It seems that many people have been mislabeling their pictures. I'm not familiar at all with garlic, so I'm very grateful that you are. Guess I should start reading up on them! Thanks again! Also, I wanted to let you know that I'm very much enjoying the kefir that you sent! Excellent. From your post, we stir fried our garlic scapes. really good. We've always liked them but only used them like scallions or chives. Now garlic scapes are full blown vegetable. Thanks.